To all readers of this tea blog (if there is anyone out there), you may have some thoughts on the topic of tea and you may have the urge or itch to have your say. You can contribute a tea article here. I am looking for diverse views on tea and would appreciate your input. You may send your article (some pictures also appreciated) and your contribution will be reproduced in full. Unedited. This tea blog does not earn any money.....although....I may sell my articles unwillingly for a million dollars. Just imagine me in tears when I unwillingly stuff the money in my jeans pocket. But on a serious side, do give me your musings on tea. You will be given full credit to your contribution (or stay anonymous if you wish). Thank you. Have a good Easter weekend. Pix above is a '02 Soong Pin Hao Ripe pu erh. My neighbour got back from Malaysia and got me a gift. Knowing that I was a little nutty over tea, the gift was tea-related themed. This 1st pix was a bottle of gum that is 'green tea flavored'. My kids tried it and the feedback was that it tasted like a sweet toothpaste. I suppose this gum is appropriate if you have consumed a garlic dish or some seafood and you need a quick breath freshener. The 2nd pix was slightly more interesting - green tea shampoo. The label (click for enlarged view) on the shampoo caught my eye - "used by strongest hair woman". Now what am I going to do....now....that I may now have the strongest hair too (after using the shampoo). Let me count the ways. Making whipped tea or tying up my tea boxes. What a yucky thought. I am sure there will be many more interesting and innovative uses for tea other than drinking it. Stay tuned. When you visit the major tourist attractions in China, there will usually be stalls near entrances of these attractions selling souvenirs for the tourist to purchase as a momento. In China, these stalls sell playing cards with different Chinese themes. You can purchase a set of cards with themes like Chinese emperors, old paintings, calligraphy, Chinese cuisine and even Chinese tea. 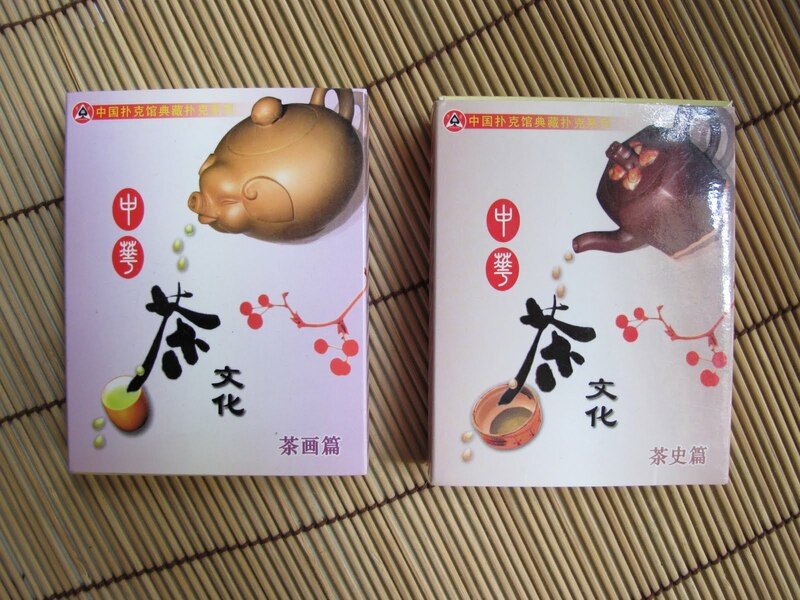 I had purchased 2 decks of playing cards with Chinese tea themes during my last visit to China. An inexpensive purchase, I recall, just under US$2 per deck. Click on the above pix for an enlarged view. 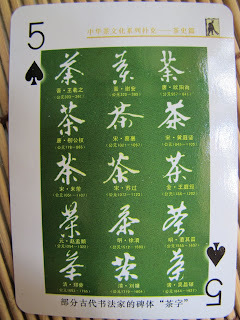 You can see these playing cards shown have pictures of old paintings related to tea. I also noticed in the deck, that there were other pictures of teapots and as well as places of tea cultivation. 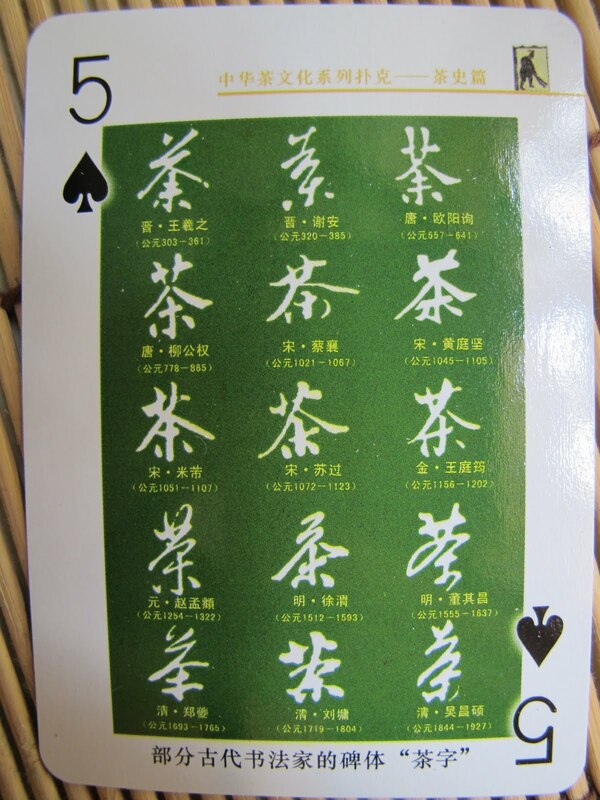 If you happen to be in China, do consider buying a deck of playing cards. Make a cool gift for a tea drinker. I broke up this 2005 Haiwan ripe tea cake (357g) with my tea knife (swiss army) as the compression of this tea cake was quite tight. You will noticed that the wrapper of the cake has a pink background. I had checked and had concluded that this pink label first appeared in 2004; a 400g ripe pu erh cake. This pink label was only used again in this 2005 pressing and I have not seen this pink label wrapper used in recent years. My initial impression while opening up the cake was good as I could smell a nice strong ripe pu erh aroma. I took quite a number of brews; experimenting with varied amounts of tea leaves as well as infusion times before I came up with a brew I liked. It was, to my personal preference, using less leaves (6-7g to a 160ml teapot) and extending the infusion times by a couple of seconds. The taste was something like dried berries or dates with a hint of cooked asian rice. I particularly enjoyed the aftertaste of this tea very much. Drinking the tea was very smooth and I get a mild sweetish sensation in the back of my throat a few seconds after consuming the tea. I had bought this tea in Singapore a couple of years ago. I recently went back to the shop to buy another cake but it was all sold out....#%&@ (censored tea language).